(CNN) -- A memorial cruise is scheduled to set sail 100 years after the sinking of the Titanic, following the same trans-Atlantic route as the ill-fated ship, according to organizers. 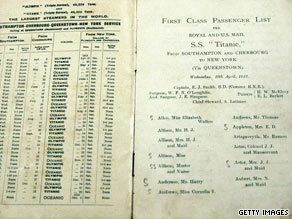 A list of first class passengers for the R.M.S. Titanic is one of the artifacts that remains after the sinking. The Titanic Memorial Cruise is to set sail in April 2012, departing from Southampton, England, on April 8, just as the Titanic did. On April 15, the ship -- the Balmoral -- will arrive at the spot in the North Atlantic where the Titanic sank after it collided with an iceberg. Passengers on the 2012 cruise will take part in a memorial service at the site, according to organizer Miles Morgan Travel. Artifacts from the Titanic and a piece of the ship's hull have been recovered, but most of the wreckage remains where the luxury cruise liner sank. The 12-night memorial cruise will then take passengers to Halifax in Nova Scotia, Canada, so they can visit cemeteries where some of the Titanic victims are buried. The trip will end in New York, where the Titanic was headed. Prices for the trip start at $3,900. Millvina Dean, thought to be the last survivor of the Titanic, died in June 2009 at age 97, according to friends. Dean was an infant when the Titanic -- publicized as "practically unsinkable" and as the largest passenger steamship at the time -- struck an iceberg on the night of April 14, 1912, during its maiden voyage from Southampton in southern England to New York. The ship sank less than three hours later, killing more than 1,500 people. Dean's brother and mother also survived the sinking.